Root-knot nematodes (Meloidogyne spp.) are small, soilborne, worm-like organisms that infect many agricultural and horticultural plants. Root-knot nematodes are found worldwide, and are named for the swellings (called “galls” or “knots”) that they cause in plant roots. Economically-important species of Meloidogyne include M. arenaria, M. hapla, M. incognita, and M. javanica. Of these, M. hapla (commonly known as Northern root-knot nematode) is most likely to be found in Wisconsin soils. Root-knot nematodes cause swollen, distorted roots that can interfere with movement of water and nutrients within a plant. embedded inside roots. They are impossible to see with the naked eye. Juvenile root-knot nematodes (both males and females), as well as adult males, are vermiform (i.e., worm-shaped) and live in the soil. Adult females are spherical in shape and live inside roots. Both males and females possess a thin, tube-like structure called a stylet that they use for penetrating root tissue. 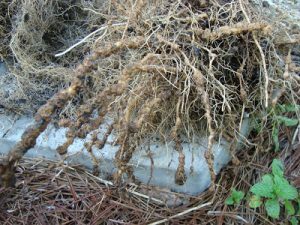 Symptoms and Effects: When root-knot nematodes enter roots, they release chemicals that cause nearby root cells to enlarge. This leads to the formation of swollen, distorted areas in roots known as galls or knots. The number and size of galls varies depending on plant species and cultivar, and the number of root-knot nematodes in the soil. On some hosts (e.g., grasses) root swelling can be very difficult to detect. Nematode feeding interferes with proper root function (e.g., water and nutrient movement). Thus infected plants may be stunted and wilted, may exhibit discolorations (e.g., yellowing) typical of plants with nutrient deficiencies, and ultimately (in field or vegetable crops) may have lower yields. Because root-knot nematodes tend not to be uniformly distributed in the soil, symptomatic plants often occur in patches and are typically surrounded by plants of normal height and appearance. Environmental factors such as slope, soil type, or soil moisture can cause similar patchy patterns, so identification of a root-knot nematode problem requires examination of symptomatic plants at a lab qualified to perform nematode diagnostics. Life Cycle: Root-knot nematodes (i.e., M. hapla) are native to Wisconsin and can be spread whenever contaminated soil or infected plants are moved. Root-knot nematodes survive the winter as eggs in the soil. Like insects, root-knot nematodes have several juvenile stages and the nematodes molt (i.e., shed their outer layers) as they grow. The second juvenile stage of root-knot nematode is the most important, because at this stage the nematode seeks out and infects plant roots. Once it has entered a root, a root-knot nematode molts three more times before becoming an adult. A male root-knot nematode is able to move about freely and can leave a root. A female root-knot nematode remains and feeds in a given location within a root. Eventually, a female enlarges to the point where a portion of her body extends to the root surface and this allows her to lay her eggs in the soil. In some hosts, eggs can also be found within the galls. Control: If you are having a root-knot nematode problem in your garden, consider crop rotation and the use of cover crops as management tools. See University of Wisconsin Garden Facts XHT1210, “Crop Rotation in the Home Vegetable Garden” and XHT1209, “Using Cover Crops and Green Manures in the Home Vegetable Garden” for details. If used properly, these techniques can be effective in reducing the number of root-knot nematodes in the soil. M. hapla, the root-knot nematode species most common in Wisconsin, does not infect corn, wheat, oats or rye, so use of these crops in a rotation or as cover crops often provides great benefit. Cover crops of French marigolds (Tagetes patula) also have been shown to reduce the number of root-knot nematodes in soil. This common garden ornamental releases a chemical (alpha-terthienyl) that is highly toxic to root-knot nematodes and prevents their eggs from hatching. As an added bonus, root-knot nematodes are not able to develop properly in marigold roots. When using crop rotation or cover crops, proper broadleaf weed control is critical because weeds can provide a place for root-knot nematodes to survive and reproduce. Finally, consider amending the soil in your garden with organic matter such as compost or leaf mulch. Such amendments tend to increase the diversity of microorganisms in the soil and can encourage the growth of certain soilborne fungi that ensnare and feed on root knot nematodes, and parasitize their eggs. For more information on root-knot nematode: Contact your county Extension agent.